Rocking Nursing Chairs are the must have item for your nursery. This was the result of a recent ‘Ask Mum’ review survey where the rocking nursing chair came out top of the list. A good nursing chair could provide a relaxing place for you and your baby to bond during feeding time. If you are looking for a nursing chair and have yet to decide which to buy then you have come to the right place. Nursing chairs really are a great addition to your nursery but don’t leave it to chance. Read our reviews and find out which is the best nursing chair in UK for you. 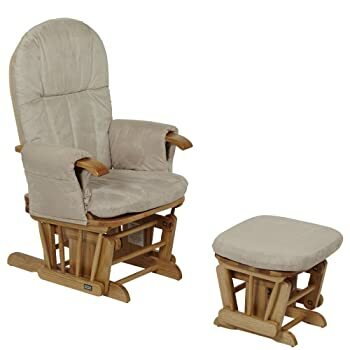 Nursery rocking chairs or glider rocking nursing chairs as they are often called seam to be the source of much confusion here in the UK and probably further afield. When my friend was expecting her first baby we spent ages trawling through different websites looking at rocking nursery chair reviews and the like. I wasn’t really sure what distinguished normal rocking chairs from nursing chairs but by the end of the evening we learned so much that I not only knew what a nursing chair was but I could tell you all the different types and how they worked. We have listed the main nursing chairs, together with a summary and rating in the table below for your convenience. For those who are in hurry can check out our top nursing chairs in UK for 2018 in below comparison chart. If you’d like details on any model, click on the links in the table or read our reviews below. A great nursery chair with a smooth glider action that makes the Tutti Bambini Espresso one of the quietest we have come across. Good safety features and wipeable covers at a good price. The range comes in a variety of colours and features to suite most nurseries. Tutti Bambini GC35 Recliner Glider Nursing Chair & Stool is fast becoming a real popular addition to any nursery. From the feedback we have received, alongside our own tests, we believe this nursing chair is one of the best value on the market. It has all the features you would normally look for in a nursing chair i.e. quiet, safe, comfortable, easy to clean and fairly compact. In terms of quality, it compares highly against more expensive alternatives. Comfortable by design, this nursing chair comes with wipe down leather coverings with enough soft cushioning to help you relax whilst feeding the baby or just putting your feet up after a long hard day. Whilst some nursing chairs creek as they rock; not the Tutti Bambini. In fact, due to it’s glider mechanism, this was one of the quietest nursing chairs we have come across. That’s always a good thing when getting the young ones off to sleep! This Tutti Bambini nursing chair also has useful pockets on either sides of the arms which is useful for storing little things. The Tutti Bambini nursing chair and stool also has a safety feature to stop small limbs getting into the rocking mechanism. Many nursing chairs have this but not all. This nursing chair has dry cleanable cushions and comes in a number of different colours to match your room. If you are looking for a nursing chair, the Tutti Bambini should be near the top of your list. It has great features, highly functional and comes in a great price. The Hush Hush rocking nursing chair breaks the mould with this exceptionally comfortable chair and stool which can also easily be converted to a normal arm chair. It comes ready assembled and in two colours. You may have seen the traditional style rocking nursing chairs made of exposed wood and cushions. These have been the mainstay of nursery furniture for many years. The Hush Hush Rocking Nursing Chair is a departure from the tradition and would look more at home in the lounge than in the nursery. In fact, one reason why some people select this over a traditional nursing chair is that the rocking mechanism can easily be removed and the chair used as a normal arm chair with stool. For those looking for a long term investment this is an excellent idea. Having said that, some other people are buying the chair as an addition to the lounge with no intention of using it as a nursing chair. So, with such a versatile product, you can imagine that these are flying out of the warehouse. The first thing to say about the Hush Hush Rocking Nursing Chair is that it is very comfortable. It has lumber support but as with any armchair, you may find a supporting cushion may help, but as armchairs go, this is overall very comfortable. The material is hardwearing and can be wiped clean but is not removable. The rocking movement is basic but quiet and relaxing. A genuine rocking motion as opposed to the slider or glider motion that some nursing chairs offer. In terms of quality, we were very impressed. These chairs are hand made and use good quality materials. The price is also excellent which is another reason why people are choosing these over other products. That said, the RRP is quite high but nearly always discounted. If you buy at Amazon you will find the price highly competitive. If you are looking for a good all round product then the Hush Hush Rocking Nursing Chair may just be the answer. The KUB Haywood Nursing Chair is very popular and has been on the go for a number of years and has changed little in that time. This is not necessarily a bad thing and in some ways offers a level of reassurance. We have tested these models before and have always found them to be very well made, of generous proportions and very comfortable. In terms of price, they offer exceptional value for money, especially given the quality. The upholstery is good and can be removed just like all the others. One criticism of this nursing chair is that it does not recline or lock like many other nursing chairs. Whilst this may not be the end of the word, it is a feature that many have come to expect. Having said that, they do seam to have the base and back at just the right angle for it to provide a very comfortable sitting position whether for a petite mum or a 6 foot dad. The rocking motion is very gentle but not as smooth as some. Once again, it is more traditional than technical. Some of their competitors offer steel sliders with sealed ball bearings. With the KUB Haywood Nursing Chair you get none of that, just a traditional style rocking mechanism. Having said that, it may not be as smooth as some but it certainly isn’t an issue either. We have always found this nursing chair to provide a very relaxing experience. The KUB Haywood nursing chair also offers the advantage that it meets UK and European safety regulations. All in all then, the KUB Haywood Nursing Chair offers a very traditional, comfortable, and safe option. It doesn’t wow you with multiple locking positions and high tech glider technology but it does the job well and alway has done. Well it won’t surprise you to learn that a rocking nursery chair is a nursing chair for the nursery. That much is easy. The next bit, as you may have gathered is that these are also called glider chairs and are used by mothers to breast feed and nurse their child. Usually this ends with the child being rocked off to sleep. So, the first thing to know about rocking nursing chairs is that they are a form of rocking chair. The second thing is that nursing chairs are also sometimes referred to as glider chairs, gliding chairs and breast feeding chairs. 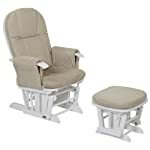 The term glider chair refers to the rocking mechanism that many nursing chairs have. Unlike the rocking chairs of old, the smooth and silent movement distinguishes the glider chair. The last thing you need when nursing your baby off to sleep if the creaking and squeaking you normally get with the old fashioned rocking chairs. Glider chairs also provide a degree of safety for the young child. If you remember the old fashioned rocking chairs, they were a safety hazard inasmuch as young children were forever trapping their tiny hands and limbs in the mechanism. Most modern nursing rocker chairs provide a safe mechanism and some even come with a EU safety certificate. There are other aspects of the rocking nursery chair that distinguishes it from the standard rocking chairs. Many of them have detachable fabrics and covers, which is very useful when you are likely to be spilling milk and baby food all over them. They often also come with a footstool for the ultimate in relaxation. I wasn’t convinced about the idea of a rocking nursery chair to begin with. It’s like many devices. You don’t think you need one until you have one then you can’t do without them. I am now a convert and since becoming a mother I have purchased my own nursery rocking chair and wouldn’t be without it. Price – You don’t need to spend a lot on a nursing chair, In fact, for a little over £110 you can be up and running with the Habebe Glider Rocking chair. This for many is the nursing chair for those on a budget. Safety – Most these days must comply with UK and EU safety rules. We consider all of the chairs featured on our website as safe. However, care is still needed where there are inquisitive toddlers about. Cleaning – Baby’s are prone to being sick and where there are baby’s there is milk and other potential problems. Although it is considered good practice to have a towel to hand, there will always be accidents. Most nursing chairs are easily cleaned and have removable covers. If this is important to you please check before buying because some don’t. Assembly – We have found this to be a worry for many potential customers. There is nothing worse than having to start assembling a complicated kit in the middle of everything else you need to be doing. This needn’t be the case. All of the nursing chairs we show either come readily assembled or can be assembled in 10 minutes or so.